This month, we’re living in an apartment in Oroklini, Cyprus, with a view of the Mediterranean. There’s a huge wraparound balcony covered with brilliant pink bougainvillea flowers, padded sun loungers and a hot tub large enough for six. Our companions are Sakkara and Baileez, two gorgeous award-winning Persian cats. Last month we were in Bagni di Lucca, Tuscany, in a four bedroom villa for nine days with the company of Bengy the wonder dog and TC the jet black cat, and the month before we were in a stunning house in the mountains of Provence with Noisette, a wonderful chocolate lab who became our hiking companion. Since mid December, we’ve “lived” in England (first in Surrey with Gizmo, a delightful cuddly cat who adopted us as her own, and next in the heart of London), France (first in the tiny village of Comigne, near Carcassonne, with two dogs and three cats, then in Plaisians, Provence), Italy and Cyprus. Our next home destination is Greece in June. We’ve been in villas, townhouses and apartments. One homeowner left us their car, two places came with cleaners and all were comfortable, attractive and extremely appealing. The cost of staying in these luxurious pads? Nothing. Welcome to the wonderful world of house sitting. Where all you need is an airline ticket, a little flexibility, a love of animals and a responsible disposition. It all started when we were in Cambodia and I had the bright idea of joining a house-swapping website (even though we didn’t actually own the place we wanted to swap). Then, when Skip and I decided to spread our wings, become homeless and explore the world, we realised we didn’t actually need a place to swap. We could stay in other people’s homes. So we joined TrustedHouseSitters and Mind My House (just a couple of many housesitting sites out there) and started browsing. For the low registration cost of between $15/month and $20/year, respectively (depending on the plan you select), you put together a profile on yourself on the websites (who you are, what you do, why you’re the perfect person to take care of a home) then register for daily alerts for housesitting assignments around the world (or in specific countries of your choice). This means that every day I receive email notices with 15 – 35 temptations from people who want sitters for Fluffy, Fido, Roger Rabbit and Chirpy Chicken. 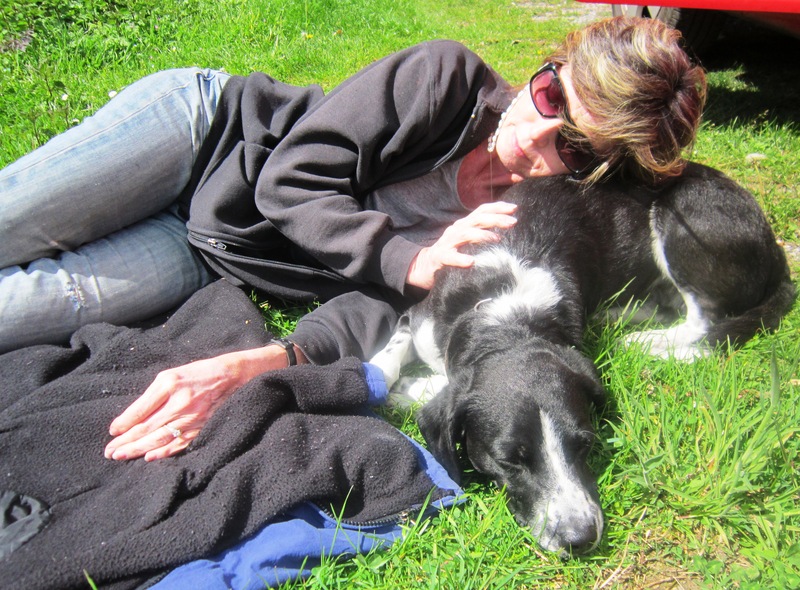 Late summer in a farmhouse in the foothills of the French Pyrenees with a 9-month old puppy and two cats. Flower sitters for my 300m field in Vermigilio, Italy for 2-3 months (on a small farm with 9 rabbits and 20 chickens). House sitter for four ducks in our home in Aruba in July. House and pet sitter for two dogs and one cat in a lodge in Botswana near the Okovango Delta for three months. A slice of paradise in Costa Rica for two months with our three dogs (on the premises are yoga classes, beautiful gardens, great location to beaches, majestic view of mountains and a spa house). It’s an amazing way to live. Not only do we have no accommodation costs or utility bills, we also get to hang out with other people’s pets, discover parts of the world we never knew existed and move into someone else’s life for weeks at a time. Before this year, we’d never heard of Comigne. 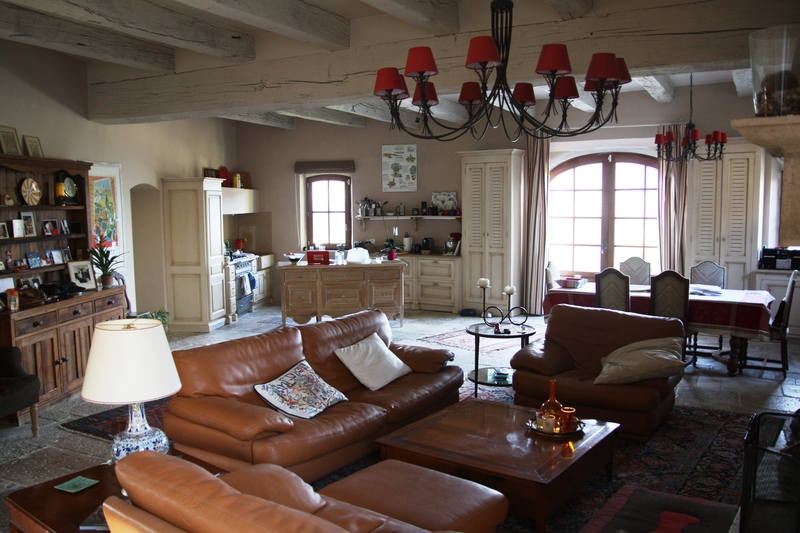 But, in January, we found ourselves in this tiny village of 200 people in the heart of Languedoc-Roussillon wine country. Here, bread deliveries from the local baker’s van were a daily occurrence and every Friday the wine cave behind our house opened up for anyone who wanted to fill their empties (for less than $2 per bottle). Our duties? 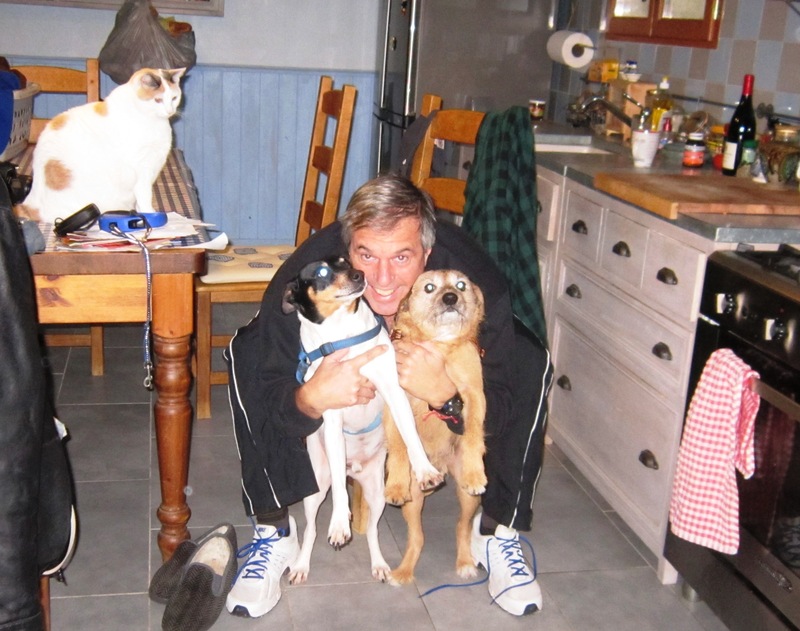 Walking and tending to two slightly psycho dogs, Derecha and Coco, making sure they and the three cats were fed from the enormous stock of frozen chicken and fish their owners had prepared for them and stoking the fireplace with enough timber to ward off the winter chill in southern France. Six weeks later, after a stint in London, we found ourselves back in France, in another place we’d never heard of: Plaisians. 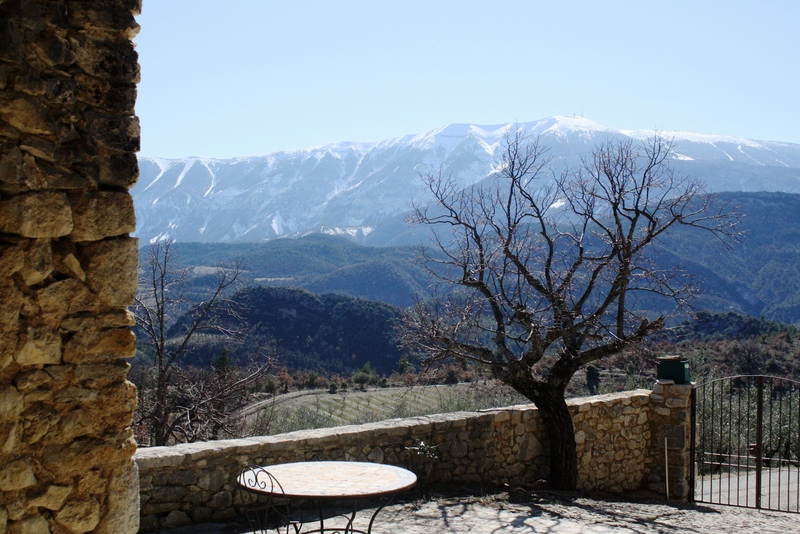 As we pulled into this tiny village and wove our way through the mountains to our new home, Skip gazed up at snow-capped Mount Ventoux with delight. This iconic climb in the Tour de France was practically in our back garden- just one of the many delights of the gorgeous three bedroom house where we were staying. Another was the enormous fireplace. Yet another was the gourmet kitchen (which Skip put to good use). 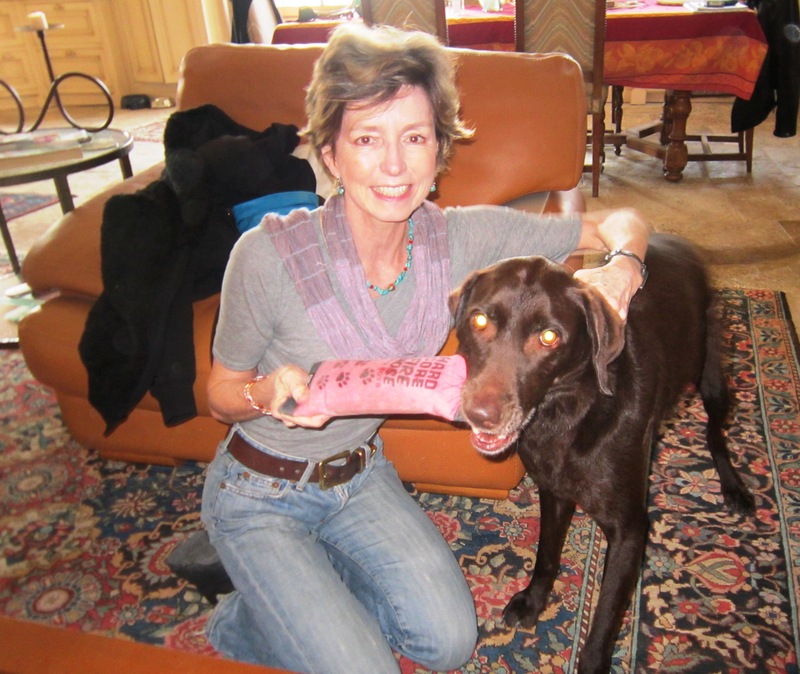 And best of all was Noisette, a chocolate lab who raised the bar on doggy perfection. There was also a bit of strenuous log chopping and chain sawing that needed to be done as well as daily cleaning of the glass door on the fireplace but it was a small price to pay for three weeks in this mountain paradise (and easy for me, since Skip was the one who did it). House sitting assignments are usually a piece of cake for anyone who is dependable and can figure things out along the way, but we’ve sometimes seen hints of responsibilities that aren’t always our cuppa tea. For example, there was a three month stint that we accepted in Portugal till we discovered the owners wanted us to walk their three dogs six times a day. And a place in Turkey that sounded like heaven till we discovered the owners had eight dogs and six cats who mostly lived in the house. We draw the line at manual labour, are unwilling to stay in a place without wifi and are learning as we go that cat maintenance is a much easier task than doggy care. There are, of course, people willing to house sit under any circumstances and, as you’d imagine, there are couples and singles; people in their 20s and in their 60s; some with kids, some travelling solo. Some house sit occasionally for free digs, and some make it their regular lifestyle in moving from place to place. Nicole Connolly and Michael Wright fall into the latter category as they started sitting in 1999 when they wanted to save on paying rent and a mortgage while they were having a house built. From there, they used house sitting on and off when on holiday. And for the past two years, they’ve been travelling full time with more than 30 house sits under their belt (including island homes, million dollar houses, quaint English cottages and city apartments) and recently wrote House Sitting, A Traveler’s Guide. Facebook friend, Talon Windwalker, has taken care of eight houses on six continents in the past year and a half. And he travels with his 12-year-old son. One of their sits in England included caring for 35 chickens and another was on an oasis in Morocco which came complete with rabbits, an outdoor sleeping area and a garden full of fresh vegetables ringed by date palms. While there’s a sitter to be found for every house, every home owner looks for something different. Jackie and Dave, who own the house in Comigne, told me they look for people who are “friendly and experienced. A couple if possible, because of Derecha (the psycho dog) and the number of animals we have and we like sitters to usually be older than 40”. It’s also a pretty crowded field of people looking for free digs. On the MindMyHouse site, for example, there are 1,636 sitters available to sit in U.S. homes and 1,640 available for the UK (never mind the other 92 countries listed). 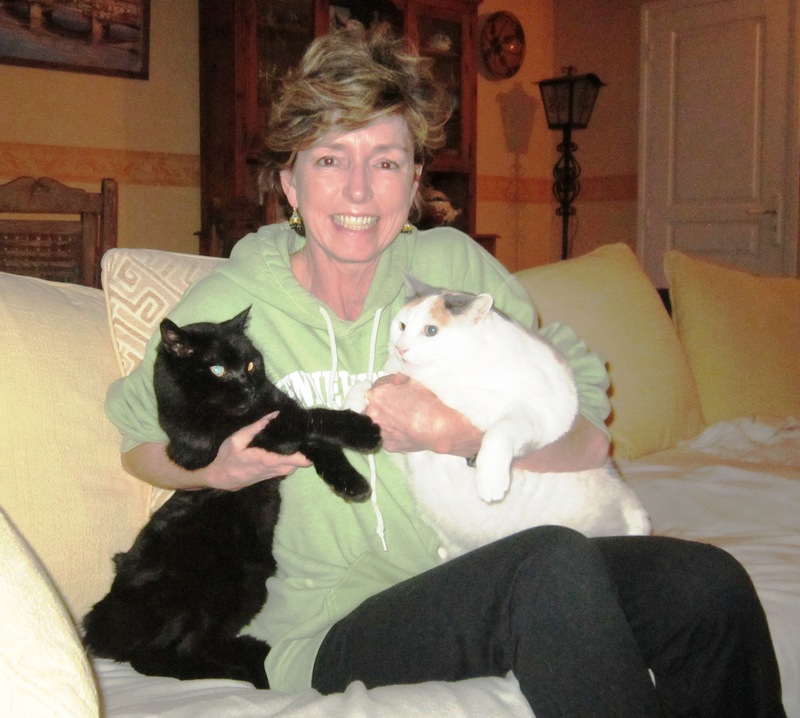 And the TrustedHouseSitter website this week lists 2,733 homes around the world that need sitters. Some are listed months in advance while others may pop up at the last minute. Our “assignment” in Cyprus came to us after we made it into the “final five” from a bank of 67 applicants and a 90-minute Skype call with the owners. 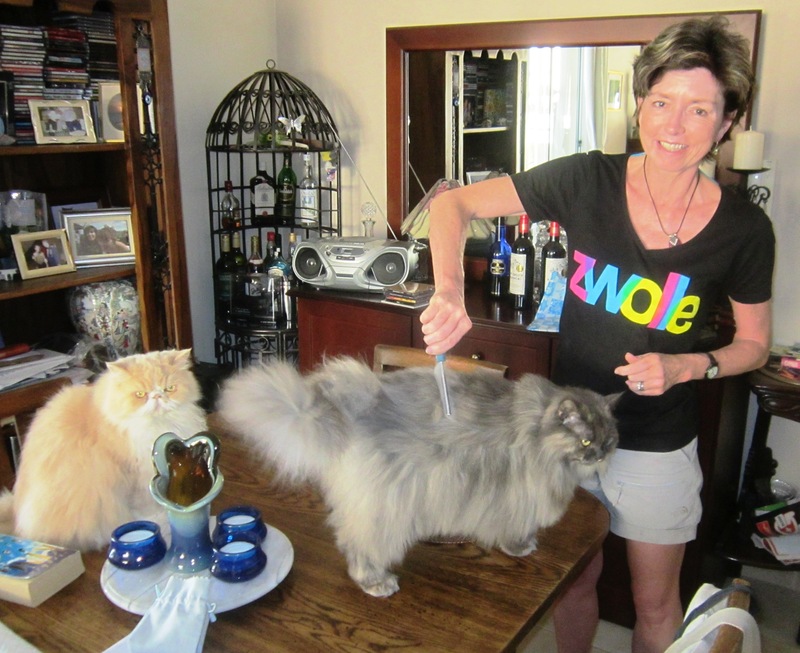 Why we were selected, we believe, boiled down to a simple matter of experience: My mum bred Persians when I was young so I had the valuable knowledge of how to groom them. Oh, and Skip and the home owner shared a love of cycling. So he left Skip his mountain bike. And I get to groom the cats. Such useful information! Just finishing up school but I’m putting that on my bucket list for sure. Haven’t kept up with Skip since high school but so happy to see what he’s up to and how happy he is! Hope to meet you someday. This is truly inspiring, Gabi. I have also enjoyed your and Frank’s FB posts and pics – as I contemplate the Third Age of life. Great article. I as a single Mum house-sit around the world and we have had a couple of bad experiences. House fitly etc, or way to much free manual labour. For those wishing to house-sit remember you can ask questions too. And when you get the good ones like our house-sit in Fiji overlooking the ocean on an island, you will go “Ahh, why own a home, when you can house-sit”. 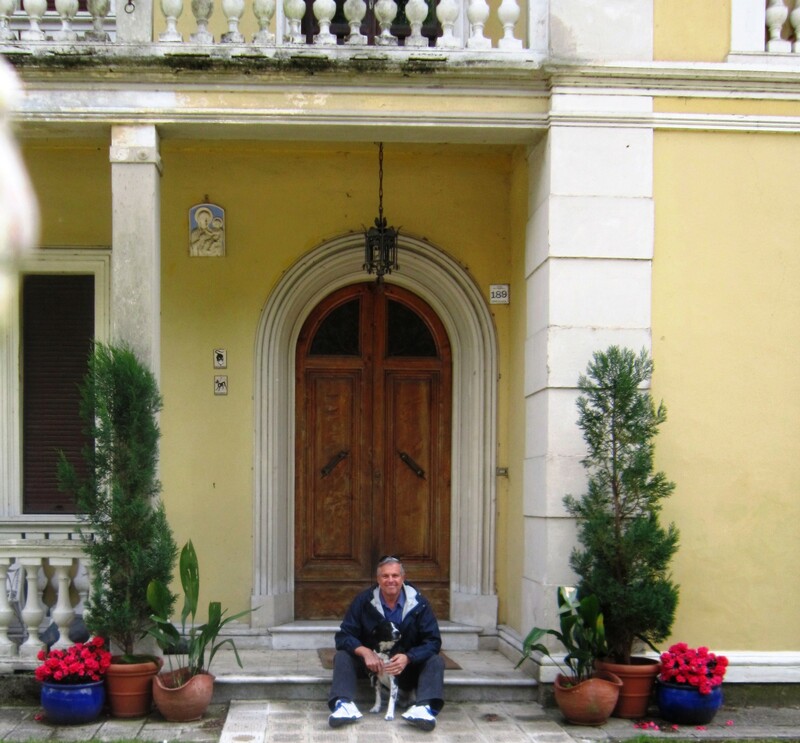 So onward we go around Europe – it is a great life! Thank you, Gabi, for all this excellent info and everyone who has commented here. You and Skip have inspired my boyfriend/adventure partner and me to post our housesitter profile asap. We can’t wait to have the same kind of exciting life, full of pets, gardens, lovely homes and far away places.